Though not quite as destructive as MegaBots, or as humbling as Boston Dynamics, Reach Robotics’ MekaMon might just be the most fun and accessible robot on the market. Leveraging augmented reality, anyone interested in a good time can whip out their smartphone to battle their bots in the physical and virtual worlds at the same time. Quite a bit of technology goes into the four-legged robots to take them from futuristic art pieces to agile fighters. MekaMon uses the camera on our smartphones to identify and track itself through an accompanying app. The app serves as the control center for steering the bots and firing weapons. Battles begin on a mat that is approximately two feet by three feet. From this point on, the bots can go anywhere — including hiding behind furniture while attempting to outmaneuver each another. The robots are shipping with both single- and multi-player modes. A single-player campaign tests players through a series of challenges that let them earn upgrades. Multi-player options include traditional combat between robots, as well as specialty modes like Tug of War and Last Man Standing. The rise of augmented reality brings with it the promise of breaking us out of our pixel-laden prisons. In the case of MekaMon, owners can physically upgrade their bots with weapons and shields and modularly trade out legs and body-parts. With all the new possibilities, it’s important for companies like Reach Robotics to begin to set some ground rules. During my conversation with Adekunle, another thing he consistently emphasized was the idea of “platform.” In the world of gaming, a platform is something that is built upon but which never gets dull because it’s constantly supported by developers. This is a particularly important distinction as we approach the holiday season. 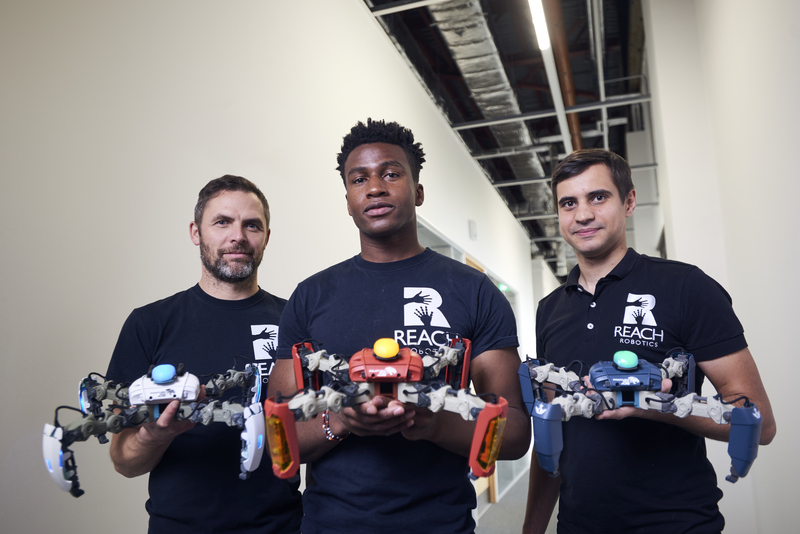 By calling MekaMon a platform, Reach Robotics is making it clear that its bots are meant to compete against larger consoles with mature ecosystems. Sure, Reach Robotics can easily release software updates to add new game modes, but the bottom line is that its hefty price tag risks putting all but the most excited early adopters of augmented reality technologies out of the market for the product. A single MekaMon is set to retail for $329, with a pack of two available for $599. Gameplay modes like Tug of War do enable two players to play with a single robot, but many features require two of the bots. One of the most comparable products currently on the market is Anki’s Overdrive. The racing toys let players battle in the real world with physical cars that are augmented by weapons controllable from your smartphone. An Overdrive starter kit retails for $149, with even a super-premium kit containing just about everything possible available for $499. Naturally, MekaMon’s core technology is more advanced. Anki’s cars do not involve augmented reality in the same way as MekaMon and the mechanics of a car with four moving wheels is far less complicated than a four-legged robot that moves in three dimensions. However, I do wonder how much of my own personal admiration and product differentiation as a tech enthusiast will carry over to the broader consumer market. Ultimately, serious platform power could emerge with potential future integrations with AR hardware like Microsoft HoloLens. This would take some time to pull off, but in some ways it seems inevitable for the AR gaming ecosystem to move in this direction. Reach Robotics’ MekaMon is available for pre-order starting today and is expected to ship in January of 2017.